It has been observed that a woman may have headaches before or during menstruation. They are thought to occur due to hormonal imbalances. In most cases, the headaches become migraines and cause vomiting, nausea and excessive pain. Nonetheless, there are means of preventing and treating headaches before period. What Causes Headache Before Period? Most people get migraine attacks for no good reason. However, some attacks have triggers. These include wine, food, and stress. For a number of women, the attacks occur right before or during menstruation. A menstrual migraine is a condition related to the falling of oestrogen levels. Statistically, only 10% or less of women are affected by this migraine. Studies have also reported that migraines usually occur 2 days prior to and 3 days into the period, and can last longer than others. There are 2 theories trying to explain menstrual migraines. The first is the removal of oestrogen as part of the normal menstrual cycle. The second credits the release of prostaglandin in the first 48 hours of menstruation as the cause. However, there are no scientific tests to prove these theories. The only way to see if your migraines are linked to your periods is by keeping a diary of both. This will also help you identify any other factors that might be causing the migraines. Pure menstrual migraine: the attack occurs only around your period and no other times. 1 in 7 women who suffer from migraines has this condition. Menstrual-associated migraine: the attacks will happen around the time of your period and other times as well. 6 in 10 women experience it. 70-90% of fertile women are affected by premenstrual syndrome otherwise known as PMS. 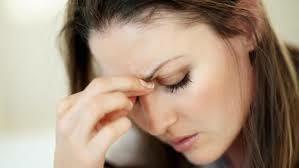 Apart from the normal PMS symptoms like mood swings and tender breasts, women can also get headaches. To be sure that you are dealing with premenstrual migraines, you need to keep a diary for at least 3 cycles. This way, you can tell if you get headaches during the second half of the cycles and if they fade when your period begins. What Can I Do About Headache Before Period? Strategies similar to those of non-menstrual associated migraines can be used to manage menstrual headaches effectively. Behavioural management is important in menstrual and non-menstrual migraines. A medical practitioner can recommend the use of triptans. Triptans are medications used to block pain signals to the brain. They ease headaches in 2 hours and control vomiting. If you have a regular cycle, you can take headache preventive medication some days before your period and continue for up to 2 weeks after you start bleeding. If your cycle is irregular or the migraines occur throughout your cycles, daily medication can be prescribed. Daily medication can include beta blockers, antidepressants, and magnesium or calcium channel blockers. A doctor will help determine whether medication is appropriate for you if you have an existing medical condition. Over-the-counter painkillers can help with a headache before period. You doctor can recommend nonsteroidal anti-inflammatory drugs like ibuprofen (Mortin IB, Advil among others) or naproxen (Aleve). Headache patterns can be changed by hormonal contraceptives like vaginal rings, patches and birth control pills. Hormonal contraception helps decrease the occurrence and the intensity of the headaches experienced by some women with whom the use of other methods have proven ineffective. However, if you have migraines with aura, avoid birth control pills because they increase the risk of getting a stroke. The doctor might also not find birth control pills suitable for people who smoke and have high blood pressure or cholesterol, are diabetic, obese or above 35 years of age even though they do not have aura. For your own good, reduce your sugar and alcohol intake. In addition, completely get rid of gluten from your diet. Also, stay away from tyramine as it is a migraine trigger found in fermented and aged foods like smoked fish, old cheese and canned meat. Try this for 30 days and you will feel a change in menstrual related headaches. If you fully understand your hormonal profile, supplements can be taken to deal with your nutritional deficiencies that might be the cause of headaches. Magnesium 5-HTP CoQ10 are recommended. Consult your doctor about the dosage. Hormonal balance is affected by stress. Finding ways to deal with PMS-related mood swings and getting rid of stress goes a long way. You can try meditations, yoga, exercise and a good laugh. Drinking about 3 litres of water a day will keep you hydrated enough and reduce the chance of having a headache before period.